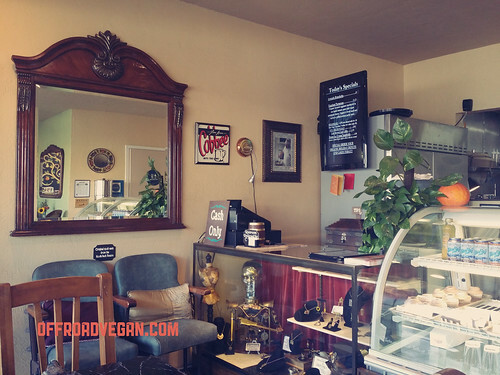 San Diego has a pretty decent vegan scene, and Moncai Vegan is a cornerstone. The nice thing about it, is that it contrasts to the “fast food” nature of other pillars, such as Evolution and Veggie Grill. Moncai Vegan is more of a take your time and relax kinda place. A funky/eclectic design felt a little cold at first, but I soon settled in. While a small space, it is setup very well with about six or seven tables. The ambiance is a bit austere, but the warm service combined with the scent of fresh baked goodies more than makes up for it. They have an awesome display case filled with donuts , cinnamon buns, and other baked goodies. I had a tough time choosing what to order, as the menu has a ton of great sounding options. I took the advice of the server, and pulled the trigger on an order of chicken and dumplings (do I still need to say vegan chicken, or do you guys get that yet lol?). 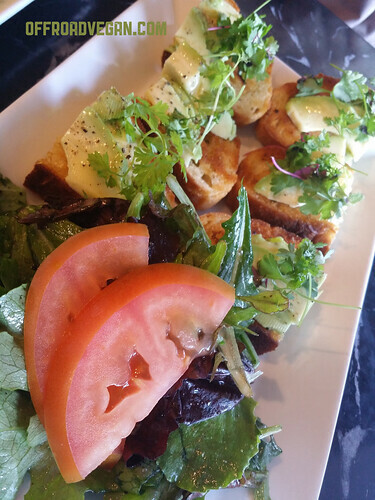 I also chose some bruschetta with fresh greens, and an order of the fried zucchini with marinara and vegan ranch. Bruschetta with fresh greens and toms. 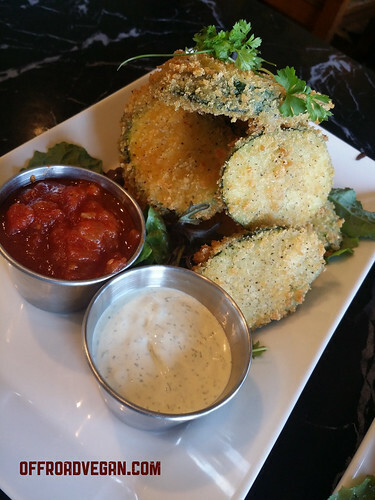 Fried zuc with marinara and vegan ranch! These two came out first, and were great starters. The zucchini was cooked perfectly and the bruschetta was amazing. Now on to the main. I honestly don’t think I have ever had chicken and dumplings, so I didn’t really know what to expect. I knew it would be hearty, doughy, and warm so I was ready for anything. 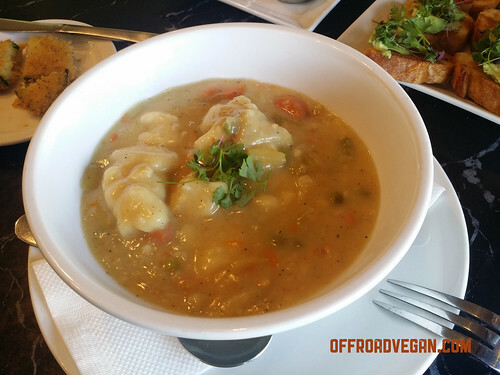 Vegan chicken pot pie. Without the pot, and without the pie. When the server dropped a huge bowl in front of my face, it all made sense. It was like a chicken pot pie but without the pie part. It was flavorful, filling, and super good. Luckily, it was a cooler day in San Diego, so I felt this was an appropriate meal. And what is vegan gluttony without a dessert!? I chose one of their awesome looking donuts and also ordered a cinnamon bun/roll (which is it, anyway?) for the next morning. This vegan rolls deep. And I mean rolls…as in…ate so much I needed a wheelchair. 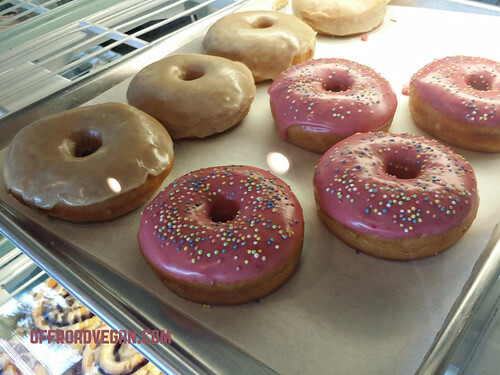 Overall, Moncai Vegan is a great part of the scene in San Diego. My only complaint is the cash only policy which I get – but needs to be reconsidered (and I mean that for all vegan businesses trying to compete). Other than that, the service was great, the food was amazing, and the space was cool. I will be back! 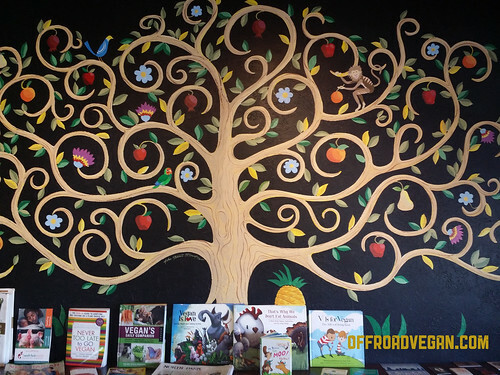 Some cool wall art and vegan books for the kiddos. Previous PostProduct Install: Rugged Ridge Low Mount SnorkelNext PostNeed your Feedback!